Hello all, here in India there are three seasons - Summer, Rainy and Winter. But my favorite is Festival Season!! Yes, Festival Season starting from August to November. There are series of different festivals all these months. And Diwali is one of the heavily celebrated festival by Indians. In my family Diwali decoration is family bonding time. 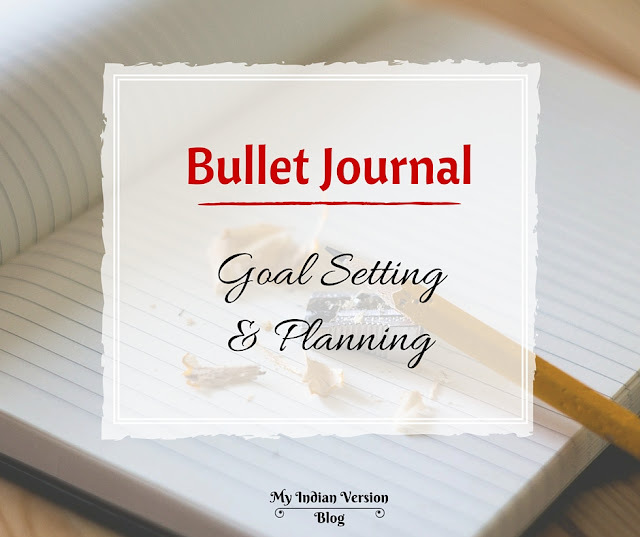 Right from brainstorming decoration ideas, shopping, making to placing them in order is done collectively. So this year I decided to bond with you all and recreate some great Diwali festival decorations. So let's bond over this Diwali festival with new series - DIWALI SERIES. 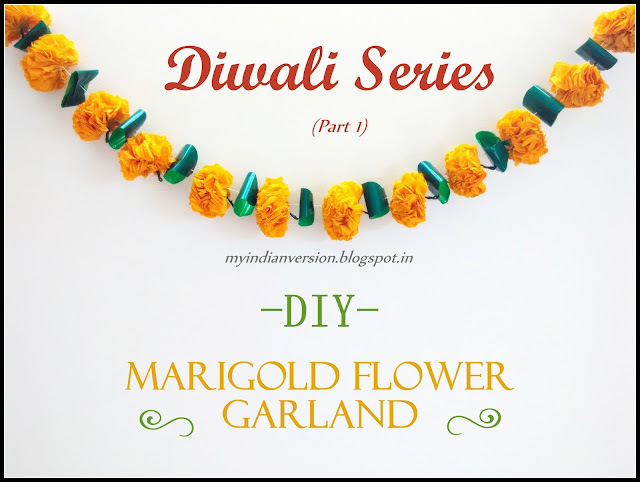 This series will cover different traditional + new Diwali decoration ideas. This is the very first post of this series..and many more are on their way!! Marigold flower is one of the auspicious flowers of India. 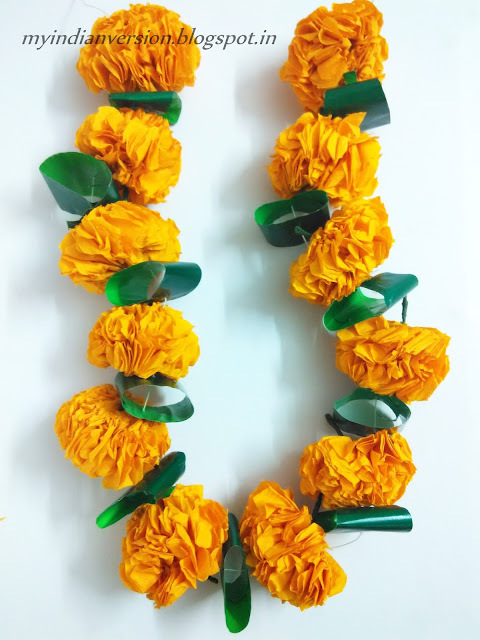 They are mostly used during festivals, in Indian wedding decor, in any auspicious day decorations and also offered to Indian deities during puja. Today we will see a traditional marigold flower garlands...but with a twist!! This garland is non-perishable!! Yes, you guessed it right, they are made from paper. 1. 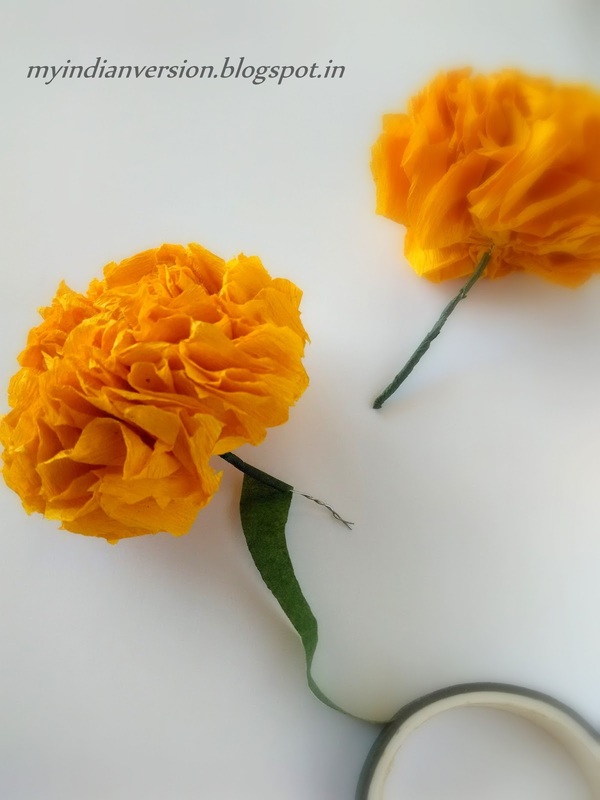 First make marigold flower using Paper Flower picture Tutorial. I made 12 flowers of approximately 2.5 inches of diameter. Now cover the metal wire using the green tape/ floral tape. Keep the length of metal wire not more than 1 inch. Mine was more than 2 inches, so I just folded and twisted it. 2. 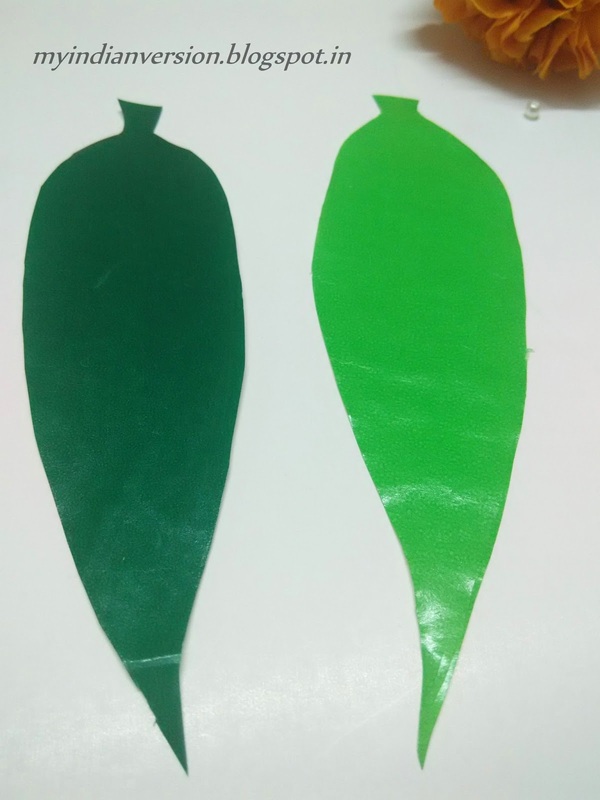 For leaves, cut elongated shape from both dark and light green colored papers. I made 11 dark green and 11 light green leaves. Now stick them on back of each other. Dark green denotes outside part of the leaf and light green inside. 3. 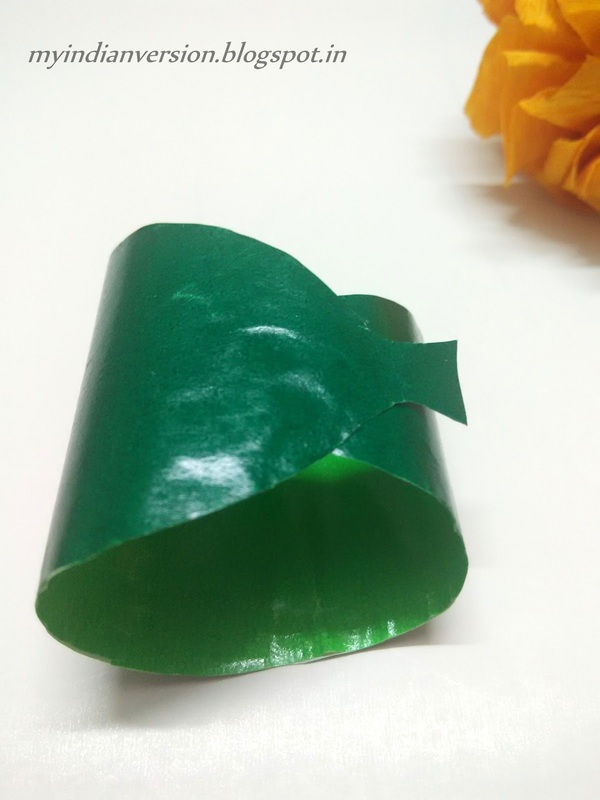 Once glued together roll the leaf, narrow tip inside. Keep the dark green color outside. Or as per your choice. The width of roll should be slightly bigger than your flower size. 4. 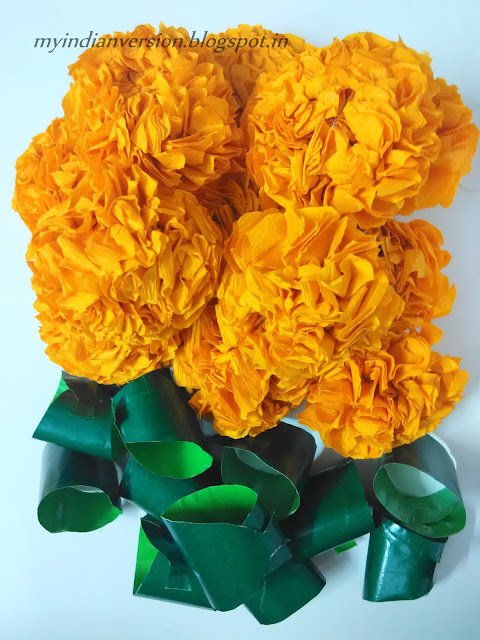 So totally I had 12 marigold paper flowers and 11 leaf rolls. 5. Now let's start making the garland. First tie a tight knot at base of flower(see in leftmost picture below). 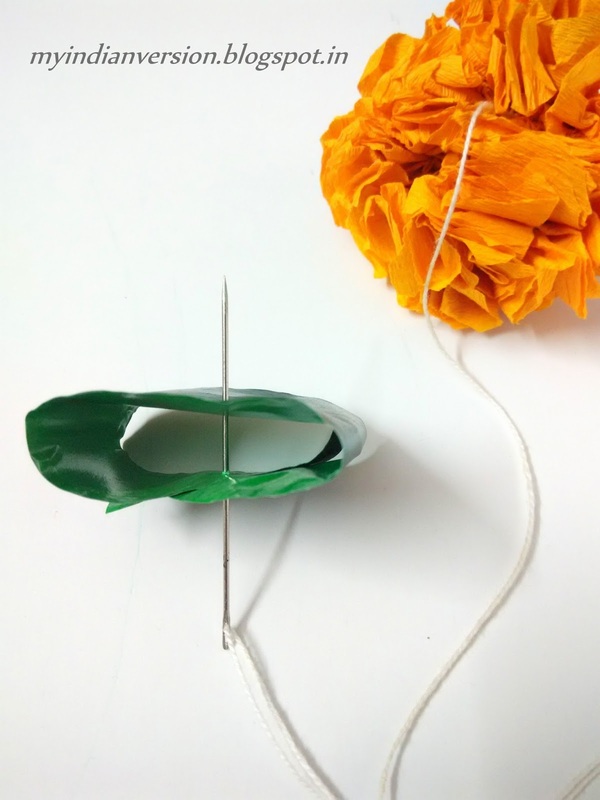 Then find the wrapped metal wire between the flower petals(see in middle picture below). Now tuck the thread in that partition till it comes back to the starting point and little bit ahead. The thread should be seen as it is coming from between the flower(see in rightmost picture below). Like you are sewing the flower from back to front. 6. 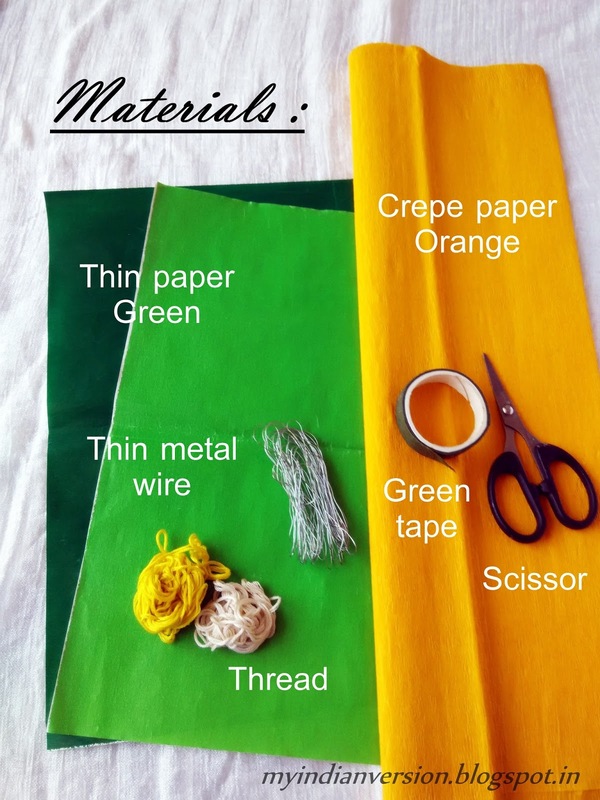 Cut the required length of the thread and add a needle to it. Using needle and thread sew the one leaf in the middle (see in the picture below). 7. 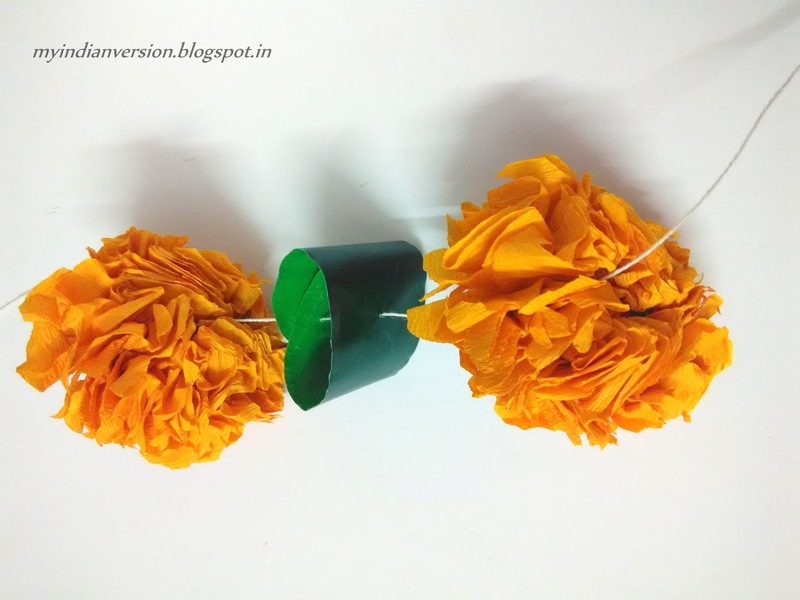 Now again tuck a marigold flower using the same procedure as in STEP 5. Remember before fixing the flower keep your eye on the gap between the leaf and flower. Flowers won't move once fixed with tread. 8. Continue till the garland is ready. This how it will look once done. Pin these instruction so that you remember it to make before Diwali. 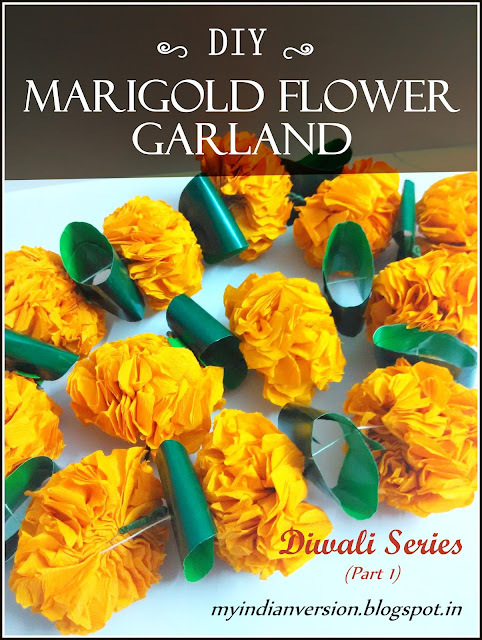 Click a photo of your beautiful non-perishable Marigold flower garland and share with me on my Pinterest and Google+ page. I'm going to make couple of them more and hang them vertically on the wall to make a traditional Diwali photo booth background. Tell me how are you going to use it this Diwali. 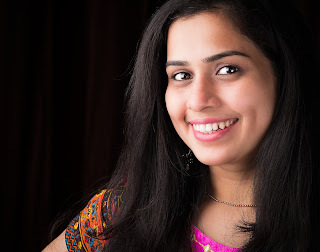 Follow me on Pinterest and Google+ for getting updates of upcoming Diwali series posts. Can you post a tutorial on how to make the the marigold flower ? Thanks! In step 1 of this post you will find a link to the tutorial. 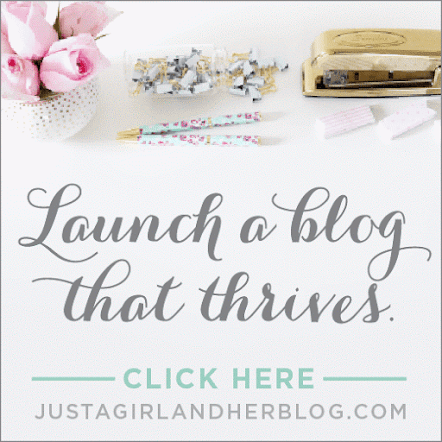 Or you can select DIY menu from the menu bar and browse for DIY Paper Flower tutorial post. I hope this helps you. Glad it was helpful to you, Soumya!